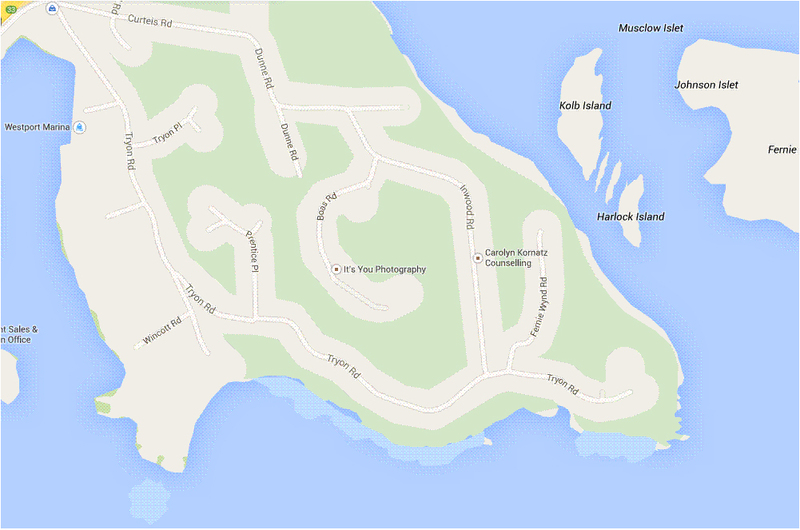 M. Wylie Blanchet (1891-1961) lived at the tip of Curteis Point in Sidney, at the end of Tyron Road, not far from the present-day Swartz Bay ferry terminal. Her original home was designed by the renowned architect Samuel Maclure and was first occupied in 1914. The house was unoccupied when Blanchet and her family bought it in 1922. According to her biographer, Cathy Converse, North Saanich was unincorporated until the 1960s so her address was listed as Tyron Road RR 1. In 1946 the Maclure house was torn down and her son, David, built her another higher up the cliff. She moved into in that house in 1947. Her address, however, was still listed as Tyron Road RR1 up until 1959, when it was given the street number 2457 Tyron Road. The most enduring bestseller about sailing and cruising along the Pacific coast of Canada is undoubtedly The Curve of Time (1961) by M. Wylie Blanchet. Originally published in Scotland when the author was 70 years old, this unlikely classic recalls Blanchet’s 15 summers with her five home-schooled children aboard a 25-foot by 6.5-foot cedar launch named Caprice. As captain of Caprice, Blanchet gained her nickname “Capi.” With advice from Hubert Evans, she condensed her family’s June–to–October adventures during the 1930s and 1940s into a series of sketches, as if all events were one extended voyage. This strange and abandoned house, which they dubbed Little House, had been designed by Samuel Maclure. It hadn’t been occupied since 1914. In 1923 the family bought their 25-foot gas boat, Caprice, for $600, after it had been sunk at anchor by ice dislodged by the Brentwood ferry. The boat was only one year old but its engine had to be overhauled after it was raised to the surface. Blanchet’s affinity for mechanics and boats was born of necessity. The engine would remain in use for 20 years until 1942. One more child was born, then Geoffrey Blanchet disappeared, under very mysterious circumstances in 1927, after he embarked on the Caprice and stopped at nearby Knapp Island. The boat was found by a Chinese gardener on the island. Blanchet’s husband might have drowned while going for a swim. The mystery of his disappearance remains unsolved. Each summer thereafter for 15 years, Blanchet rented her house to a family from Washington State and sought freedom along the coasts of Vancouver Island, taking her children whether they liked it or not. Their adventures were retrospectively recorded in The Curve of Time. The unusual title is derived from some writing she had on board by Maurice Maeterlinck (1862–1949), in which the Belgian Nobel Prize winner considered time as a curve. Capi Blanchet lived alone at Curteis Point, resisting her doctor’s advice to move. To combat emphysema and the damp climate, she sat with her head inside her oil stove for 20 minutes each day. In 1961, she was found dead at her typewriter, having suffered a heart attack. Cathy Converse’s Following the Curve of Time (2008) focuses on where Blanchet travelled and her family background. 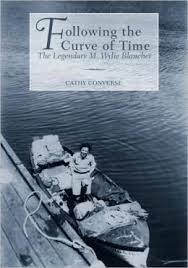 Of the hundreds of books about sailing and cruising along the Pacific coast of Canada, one of the most enduring bestsellers has been The Curve of Time by M. (Muriel) Wylie ‘Capi’ Blanchet. Originally published in 1961 when the author was 70 years old, this unlikely classic recalls Blanchet’s 15 summers with her five home-schooled children aboard a 25 ft. by 61/2 ft. cedar launch named Caprice. As captain of the Caprice, Blanchet gained her nickname ‘Capi’. For her memoir, she condensed her family’s June-to-October adventures during the 1930s and 1940s into a series of sketches, as if they were one extended voyage. Born as Muriel Liffiton in 1891 in Lachine, Quebec, Blanchet grew up in a well-to-do, High Anglican family as a tomboy who excelled in her studies. The middle of three sisters, she frequently upset her pious tutor by carrying mice in her pockets. Her father was often mysteriously absent on world travels, disappearing for a year at a time. She attended St. Paul’s private school in Montreal where she repeatedly gained scholarly prizes between 1905 and 1908, competing with her sisters for school honours. The youngest, Doris, converted to Catholicism and later became Mother Superior of the Sacred Heart Convent in Vancouver. At age 18, instead of continuing to university, Muriel Liffiton inexplicably married Geoffrey Blanchet from Ottawa. The couple relocated to Sherbrooke, Quebec where he worked a bank manager, then in Toronto where he worked at the headquarters of the Bank of Commerce. Theirs was not a marriage made in heaven. Whereas he was highly emotional, she could be intensely pragmatic. After he fell ill in his early 40s and subsequently retired, the couple and their four children drove west in a Willys-Knight touring car, serendipitously discovering and buying a cottage at Curteis Point on Vancouver Island, near Sidney, B.C., in 1922. This strange and abandoned little house, which they dubbed Little House, had been designed by Samuel Maclure. It had a billiard table on the main floor and hadn’t been occupied since 1914. It was a case of finders keepers, and Capi Blanchet kept it for the rest of her days. In 1923 the family bought their 25-ft. gas boat, the Caprice, for $600, after it had been sunk at anchor by ice dislodged by the Brentwood ferry. The boat was only one-year-old but its engine had to be overhauled after it was raised to the surface. Blanchet’s affinity for mechanics and boats was therefore born of necessity. The engine would remain in use for 20 years until 1942. One more child was born in B.C., then tragedy struck. Geoffrey Blanchet died, or disappeared, under very mysterious circumstances, in 1927, after he embarked on the Caprice from their home and stopped at nearby Knapp Island. He was never seen again. The boat was found by a Chinese gardener on the island. It was presumed that Blanchet’s husband drowned while going for a swim, but this remains mere conjecture. Each summer thereafter for 15 years, the indomitable ‘Capi’, with five children to raise and educate, rented her house to a family from Washington State and sought freedom along the coasts of Vancouver Island. With money collected from rent, and some earnings from her freelance writing, she explored the shorelines and islands in the Caprice, along with some or all of her children, preferring stiff-upper-lip stoicism to Bohemian looseness. Together they investigated old Indian settlements, canneries, marine stores, floating logging camps and traced the voyages of Captain George Vancouver, keeping a copy of his diary aboard. She also considered the claims of discovery made by the mariner Juan de Fuca. Her independent spirit led her to reject conventional notions of fashion for women. Her situation required she become adept at improvisation and repairs. “Engines were invented and reared by men,” she wrote. “They are used to being sworn at, and just take advantage of you; if you are polite to them–you get absolutely nowhere.” She enjoyed cleaning and taking apart her four-cylinder Kermath engine, grinding the valves herself, but she was also adept at playing the piano and violin. Blanchet’s adventures were retrospectively recorded in The Curve of Time, one of the bestselling books ever published in British Columbia. The unusual title is derived from some writing she had on board the Caprice by the Maurice Maeterlinck (1862-1949) in which the Belgian Nobel Prize winner considered time as a curve. At the height of this curve, one can simultaneously view the past, present and future. The original version of The Curve of Time appeared in England, published by Blackwoods in London, the company for which Blanchet had often written freelance articles. Few copies reached the West Coast of Canada. Publisher Gray Campbell of Sidney released the first Canadian edition in 1968, under his Gray’s Publishing imprint. It sold for $1.95. Cathy Converse built upon the research of Edith Iglauer for a full-scale portrait of coastal author M. Wylie Blanchet, Following the Curve of Time (Touchwood 2008 $24.95), nominated for a BC Booksellers’ Choice Award in Honour of Bill Duthie.